Yiddish songwriter, lyricist, actor, playwright, director, and producer Herman Yablokoff was born in Grodno, Russian Poland (now Belarus), where he sang as a boy chorister in the choir of Cantor (Reb) Yoshe Slonimer at the age of ten. He began playing children’s roles in local Yiddish theater when he was twelve, and at seventeen he left home to tour Lithuania and Poland with an acting troupe. In 1924, after four years with the Kovner Fareynikte Trup (United Troupe of Kovno) and travels through Germany and Holland, he emigrated to America and began playing on stages in Toronto, Montreal, and Los Angeles before settling in New York. 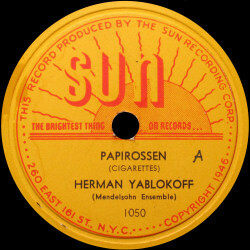 Yablokoff became one of the most pervasive personalities of the Second Avenue theater world during the heyday of American Yiddish theater in the 1930s and 1940s. One of the many major musical shows he wrote, directed, and produced was Der payatz (The Clown), which catapulted him to even wider fame under that sobriquet. He further popularized that role on his weekly Yiddish radio program of the same name. Papirosn (Cigarettes), from his play with the same title, is probably his most enduring song. Most likely an adapta-tion of a European folk melody to his own melodramatic lyrics, it is still sung today. The tune of his song Shvayg mayn harts (Be Still, My Heart) became popular in English as Nature Boy when it was allegedly appropriated by a Hindu mystic in California who dabbled in songwriting. According to Yablokoff’s own account, the plagiarist had claimed to have “heard the tune in the mist of the California mountains,” but legal proceedings resulted in a substantial monetary settlement. 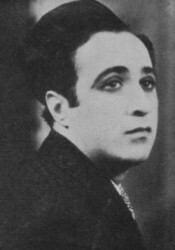 Yablokoff went on tour to Israel, Scandinavia, Europe, Cuba, and South America, and he frequently played opposite his wife, the equally well known Yiddish actress and singer Bella Meisel. But his most important trip was his seven-month tour of displaced persons (DP) camps in Germany, Austria, and Italy following the end of the Second World War, where he gave more than 100 performances for 180,000 homeless Jewish refugees from the Holocaust. He received the United States Army Certificate of Merit for that endeavor. In one of those camps he discovered his niece, who turned out to be the only survivor among all his European family. Yablokoff was first accepted into the Hebrew Actors Union in 1931 and went on to serve as its president for a number of terms after 1945. He was also president of the Yiddish Theatrical Alliance as well as chairman of the Yiddish National Theater in New York. Later in his life, reflecting upon his career, Yablokoff remarked that the Yiddish theater had constituted "a religious experience, a movement of the soul." Стоит грустный мальчик и смотрит по сторонам. Лишь стена защищает его от дождя. В руке он держит кошёлку. Голодным, оборваным, мокрым от дождя. С расвета я брожу и никто не дал заработать. Все смеются и издеваются надо мной. Несчастным и одиноким как камень. Чтобы поесть, я собираю крошки на старом рынке. Жесткая скамейка в холодном парке служит мне постелью. И мои мольбы и плач не помогают. С ней вместе мы блуждали целый год. С ней мне было намного легче. Когда я смотрел на нее, притуплялся голод. Неожиданно она ослабла и серьезно заболела. На холодной скамейке в парке она умерла на моих руках. С ее смертью я потерял все. leichter wern flegt der hinger wen ich fleg a kukt on nor oif ir. oif mayne hent geshtorbn si, oif a gassn bank.